The festival season is upon us once again. We are extremely pleased to announce that we are returning for our 2nd year at both Lovebox and Global Gathering. Lovebox is a 2 day flamboyant music festival based in the fantastic surroundings of Victoria Park. Again we will be based within the main arena easily accessible from all areas of the festival. The confirmed dates are Friday 18th and Saturday 19th July 2014. To guarantee your Vipee's toilet experience please visit our online shop for further details. Global Gathering is a 2 day electronic music festival held at Long Marston airfield in Stratford upon Avon. We will be located within the main arena, the dates are Friday 25th and Saturday 26th July. 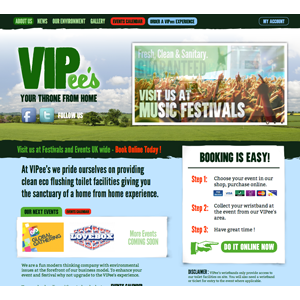 To guarantee your Vipee's toilet experience please visit our online shop for further details. We look forward to seeing old and new customers throughout the year. VIPee's V Festival Competition Launch! The VIPee's Festival Competitions have been very popular so far. We are really excited to launch our latest competition for V Festival in Chelmsford, Essex! 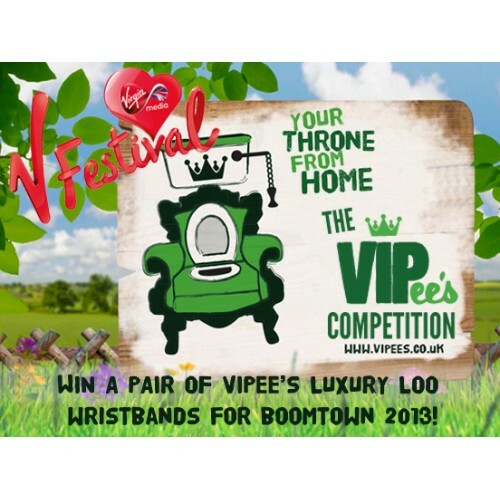 You could be in with the chance of winning a pair of VIPee's luxury loo wristbands for V Festival - one for you and one for a mate. Want to win?! Follow the link here and answer our question. - Competition closes Friday 16th August at 4pm. Only one entry per person - please see the competition page for further details and T&C's. We are really excited to announce that the second VIPee's Competition of the festival season has just launched today! Good luck to all who enter! Keep in touch on our social media sites where we'll announce the winner and announce more festival competitions! @VIPees2013 and on Facebook. So we have kicked off the festival season in style by attending Parklife Festival 2013! What a great turn out it was with many of you embracing the full VIPee's experience and enjoying your throne from home. We saw many a happy festival goer using our eco-friendly clean facilities time and time again, they just couldn't get enough of the warm hand wash and our friendly team. Check out our gallery and Facebook page to see more images from Parklife. We are now looking forward to the next big Festival of year Lovebox, buy your writsbands for a luxury VIPee experience now! We will be at the festival for all three days, so you don't have to fear the horrible portaloos anymore, we will bring the luxury of home to you. VIPee's 1st Competition of the festival season 2013! Here at VIPee's we are so excited to have lauched our first festival competition, in time for Parklife. 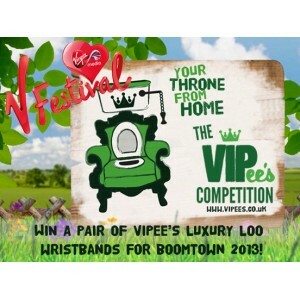 Entrants have the chance of winning not one but two of the VIPee's wristbands for the weekend! At VIPee's we are really excited about the summer of festivals we've been booked for. Take a look at the 7 confirmed events and what dates we will be at them. 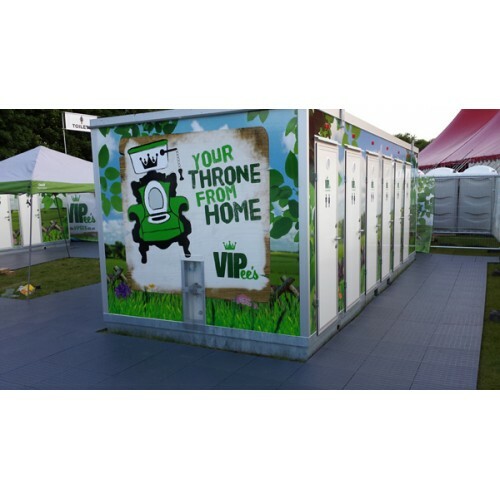 You can also check out our interactive events calendar to see where we'll be and also buy your tickets for our VIP toilets at the events here. We only have a limited number and these are selling fast. Book now to avoid dissapointment! Joining us at any of the events? Let us know by Tweeting us @VIPees2013 or joining in the conversation on our Facebook Page. We are pleased to announce the official launch of VIPee’s. VIPee’s will be offering luxury, eco friendly toilets at festivals and events. 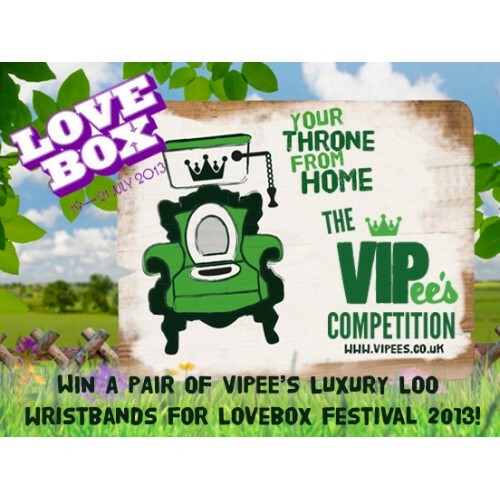 From the end of January 2013 customers will be able to pre-order a wrist band to use the VIPee’s toilet facilities at Lovebox, Global gathering, plus many more to follow. Our management team has 32 years experience between them in the event industry and aim to help make your event a pleasurable one. We look forward to seeing you in 2013 and wish you all a Merry Christmas and Happy New Year.